Payton (Dennis Quaid) and Bower (Ben Foster) kick proceedings off as they wake up from hyper-sleep aboard a space ship, that is carrying the last remnants of humanity on its way to populate a alien planet called Tanis. One of the side effects of waking up from hyper-sleep is memory loss, and neither Bower nor Payton know where they are and what they should be doing. Realizing enough to know that power on the ship should be restored, Bower sets off to fix the reactor while Payton stay behind at the command center. Bower meets a few survivors from the ship, while discovering a new species of mutant creatures that have been feasting on the ship's cargo of humans. While Bower is off trying to fix the ship, Payton has to deal with Gallo (Cam Gigandet), a survivor on the ship, who introduces the idea that Payton could be suffering from Pandorum, or space sickness, that causes intense hallucinations and warping of reality. Meanwhile Bower has to win the trust of other survivors and form fragile allegiances in order to re-start the reactor, without which the ship was going lose all power. All he learns and remembers during the re-starting of the reactor sets the movie up for it's final climax. The story line seems chaotic at first, only hitting stride half way through. In hindsight, this goes rather well with the themes of disorientation and memory loss. The screenplay strikes a blue-tinged, metallic spaceship look, that complements the inside of a dying space ship. There are enough dark spaces, screeches, and slithery creature things to bring out the heebie jeebies. 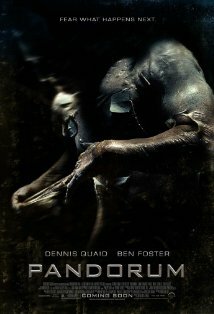 Pandorum does a lot for a movie, but does it with unrelenting intensity and purpose. If you are a fan of intelligent horror movies, and do not mind some obvious story twists, this is the movie for you. If you were a fan of the Alien series, but wished there was more in the story department, then you should stop reading now and go rent this movie.